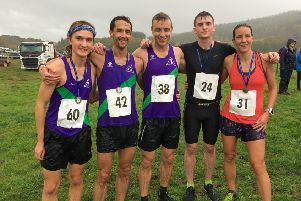 Cross Country action got underway for 2018/19 on Saturday, when near record fields took part in the first Start Fitness North Eastern Harrier League of the season, at Wrekenton, Gateshead. There was a strong wind, however, runners were not to be deterred as they sprung into action in the ten-event programme. 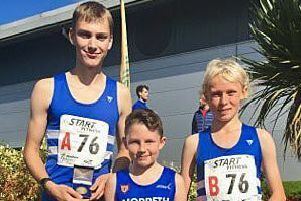 Amongst the contingent were a large number of Morpeth Harriers, who on the day managed to achieve two individual wins, one team victory, and a number of good minor placings. There were individual wins in the U3 Boys single lap race, and the combined U17 and U20 two medium lap event, courtesy of Joe Dixon and Holly Peck respectively. Joe also led the Morpeth U13 Boys home to what was the clubs solitary team victory on the day, winning by a margin of 26 seconds from Tynedale Harrier Nathaniel Henderson. Dixon was joined in the Morpeth team success, with further counts coming from excellent performances by Sam Dent and William De Vere Owen, who finished in fourth and 12th places respectively. Morpeth’s other on the day winner Holly Peck, not only won by a clear margin of f42 seconds from the Slow Pack, she was also rewarded with clocking the fastest time, and also received an on the day Harrier League medal for her achievement. She led the Morpeth combined U17/20 Women’s team home to second place, losing out to close rivals Houghton by 12 points, with further on the day team support coming from Lily Heaton, and Kay Errington, who finished 13th and 15th. A near record field took part in the three laps approximately 9k Senior Men’s field, who were led home by former North East, and Northern Champion Dan Garbutt. Morpeth Harriers had a superb turnout in this event, with a total of 19 finishers getting around, in a finishing field of 594. In a very close Division One team race, Morpeth just lost out to Sunderland Harriers by a mere six points, being led home superbly by Sam Hancox in tenth. Second Fastest on the day was his Morpeth club colleague Jordan Scott, also running from the Fast Pack, who had an excellent run to finish 19th. Third counter, and having an equally excellent run, was Sam Hancox’ s Over 50 Father Rob, in 27thk. Further Morpeth scoring counts came from Shaun Land, in his first Harrier League for the club following his Summer transfer from Alnwick, who finished 41st from the Slow Pack, Andrew Lawrence (47th) (Fast Pack), and Kris White, another Harrier League debutant, who finished 54th from the Slow Pack. Morpeth’s Senior Women certainly made a promising start to this year’s Division One League campaign, by finishing third on the day behind winners Tynedale Harriers and second placed North Shields Poly. The club were led home by Vicky Gibbs in 11th. Six places behind Vicky, was her Morpeth club colleague Emma Holt. Morpeth’s excellent scoring count was completed by newcomer Rachel Falloon. Although they just lost out in the team race to Houghton in the team race, Morpeth Harriers U17 Men performed superbly in their two medium lap affair, by providing the event with its third, fourth, and fifth fastest finishers in the field of 31. Tom Balsdon very nearly won the event, just losing out to Houghton’s Will Bellamy by a mere second in a closely fought encounter from the Slow Pack. Not far behind Bellamy and Balsdon in third place was Morpeth’s Rowan Bennett, making his Harrier League debut for the club following his summer transfer from Elswick. And completing the Morpeth U17 Men’s scoring count was Daniel Melling, who posted a fifth fastest time from the Fast Pack, to finish 12th overall. Very much in superb form at the moment is Morpeth’s U15 Boy Euan Duffin, and he certainly kept up this form, by easily posting the fastest time in their one lap race. Giving 100 seconds away to a good proportion of the 62 strong finishing field, Duffin worked his way through to finish 13th overall from the Fast Pack, leading his club to second team place behind a strong Tynedale Harriers .